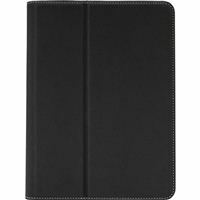 The VersaVu Classic Case for iPad provides protection and added functionality for your tablet. A flexible tray delivers all-around protection and rotates 360 to switch easily between portrait and landscape viewing. The tray is structurally designed to redirect sound for enhanced audio. The microfiber lining protects your screen from scratches, and deep grooves on the interior cover offer a stable base for a range of viewing angles. This case also offers military grade protection for drops up to 4 feet.